I guess I should just come out and admit it - yes... like so many furries out there, I love the new My Little Pony : Friendship Is Magic. I've watched every episode that's been made so far, and my favorite character (by a long shot) is Rarity... mostly because she's so close personality-wise to Jaspy. Conceited, narcissistic, haughty, and hilariously self-centered, she's definitely the best written character in the series, and the most well-conceived. Each character seems to be constructed around a single over-arching concept... but her's is the most clear. So yes, I suppose you could say I'm a brony.... but I sorta hate that term. "Bro" to me means "Frat Member". And I don't know any "bronies" that really fit that stereotype... so I find it extremely misleading and perhaps even a little offensive a term... but if that's the term people use, I don't see how I can really get away from it. Anyway - I mentioned in my Inkbunny journal that I was going to support this site, and here's the first step I am taking in that direction! This piece will be an INKBUNNY EXCLUSIVE image. I'm not posting it to any of my other art sites. Well... 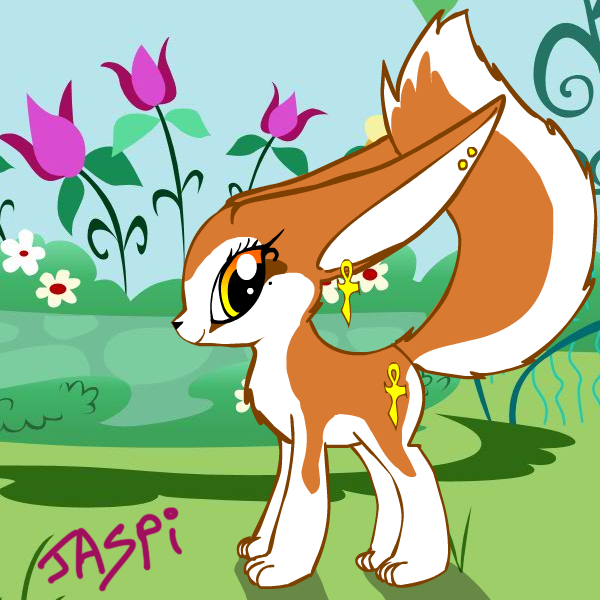 I might put it up on Artspots eventually, since there's so little on that... but inkbunny will have the only "complete" Jaspian art collection on the web. She looks beautiful. Nicely done.